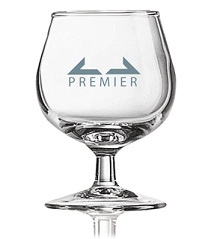 Customise the perfect company promotion gift or the perfect freebie for favourable customers with our Company Brandy Glass for Business Gift. Personalisable with an engraving area, you can promote your company in absolute style with this promotional brandy glass to expose your company brand name and logo in a crystal clear finish, resulting in the most professional feel and crisp look to your company image. Choose up to 50 characters for the perfect display message, your brand name and your LOGO! Why not have this sat in your customers display cabinet ready for that occasional celebration of brandy? * 24% Lead crystal brandy glass.